The Type-52 Anti-Aircraft Artillery, (abbreviated Type-52 AAA), often referred to as the Anti-Air Wraith, is a specialized variant of the Type-26 Wraith tank. The Type-52 Anti Aircraft Artillery is a variant of the Covenant Wraith tank, but it differs in its primary armament; while the standard Type-26 model is equipped with a plasma mortar, which is used mainly against slow-moving ground targets, the Type-52 model is equipped with two rapid fire, triple barreled heavy fuel rod cannons as its main armament, and is highly effective against nearby air targets as well as ground targets. The Type-52 shares the Type-26's secondary plasma turret, a non-detachable stationary turret emplacement fixed at the midsection of the vehicle that is optionally manned for defense against medium to close range ground targets. It should be noted that the fuel rods fired by the AA-Wraith can explode mid-air, creating a cloud of plasma, resembling the clouds of shrapnel produced by modern day flak guns' bursting rounds. The double sets of fuel rod cannons fire Class-3 fuel rods, which have the capability to track vehicles' heat signatures. They are devastating to both airborne and ground forces. Dozens of shots can be put out in rapid succession, laying waste to enemy emplacements, leveling fortified bunkers in a matter of seconds, and removing an enemy aerial presence. The cannon can also be a threat to low flying Longsword fighter-bombers, even though they have heavier armor than the Pelican dropship. Luckily, however, the Anti-Air Wraith seems to be used almost exclusively for destroying and harassing air vehicles and use against ground targets is very rare. The Type-52 is also distinguished from the Type-26 by its red crimson color scheme instead of the standard Wraith's blue-purple armor color. Upon the driver's exiting the AA Wraith, its double flak cannons fold inward and contract into the body of the tank, presumably to keep them protected from enemy gunfire or saboteurs and possibly to allow more compact storage. It might even be necessary in order to travel at high speeds or be air-lifted by a Type-52 Phantom dropship. Like the Fuel Rod Gun and Energy Sword of Halo: Combat Evolved, it has a dead man switch, causing the vehicle to self-destruct when the driver dies or exits. Except for a glitch, the AA-Wraith is otherwise inoperable by the player. Type-52 Anti Aircraft Artillery was first encountered late in the Human-Covenant War and saw widespread deployment by the Covenant in the occupied Inner Colony worlds of the Unified Earth Government. 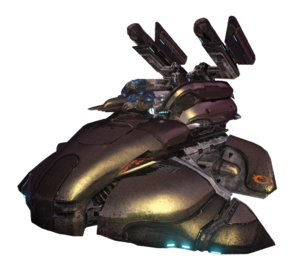 Though ONI analysts presumed the vehicle was a dedicated air defense vehicle, the Covenant often deployed AA Wraiths as a direct assault vehicle against UNSC forces in urban areas. AA-Wraiths were deployed during the Covenant occupation of New Mombasa in October 2552. Two were deployed at the Kikowani district to defend the Huragok recharging stations. A third was stationed along Waterfront Highway, part of the extensive expanse of defenses there. Multiple Type-52 vehicles were also deployed in the African city of Voi during its Covenant occupation in the Battle of Earth. All of them were eventually destroyed in the UNSC counterattack, and the glassing of a small part of Africa. Several more were deployed against a possible UNSC threat when the Covenant secured the Forerunner facility known as the Ark. After the Human-Covenant War, AA-Wraiths would be used during the Battle of Draetheus V in 2554 by Merg Vol's Covenant against UNSC forces. A number of AA-Wraiths would also be used by Jul 'Mdama's Covenant during the Battle of Installation 03 in July 2557. By October 2558 the T-52 AA Wraith has largely been replaced within the Swords of Sanghelios and Jul 'Mdama's Covenant with the Type-58 Anti-Air Wraith. By April 2559 the Banished had largely replaced their supply of T-52 AA Wraiths with Reavers. It seems that Bungie originally considered making the AA Wraith a drivable vehicle, since when the player takes control of it with a glitch and then jump out of the Wraith, an animation of the cannons folding together and going down through the hatch can be seen, much like the normal Wraith. The fact that the AA Wraith is drivable at all proves this fact, but it was likely made unusable due to it being significantly overpowered. It also contains its own special aiming reticule which is seen nowhere else, and seems to be a reticule designed specifically for the AA-Wraith. Similarly, there is no targeting reticule for the AA Wraith's gunner turret. The Anti Air Wraith controlled by the player is not as effective at destroying aircraft as one that is operated by an AI, because the AI is more efficient at targeting and leading; as such, it will know where the aircraft (sometimes even if controlled by the player, although the AI will most likely not hit the player) will move based on current readings (sudden course changes notwithstanding). A shot from a Fuel Rod Gun is more powerful than a single shot from a cannon on the Anti Air Wraith. This is probably because of the faster rate of fire and infinite ammo the Anti-Air Wraith has, making it overpowered otherwise. A view of an unoccupied AA Wraith in Halo 3. An Anti-Air Wraith being dissected by an M6 Spartan Laser. An Anti-Air Wraith in Halo 3. An Anti-Air Wraith shoots at an AV-14 Hornet. An Anti-Air Wraith on The Ark. John-117 driving an AA Wraith. A T-52 Wraith in Halo: Spartan Assault. A T-52 AA Wraith in Halo: Ground Command.